For decades now, the Emmy and Peabody Award-winning team of Kate Davis (Girltalk; Southern Comfort) and her producer and sometime co-director David Heilbroner (Stonewall Uprising) have been giving voice to marginalized communities by listening closely to individuals, allowing their characters to express their own complicated truths—and thereby correcting the easy stories too often assigned to them by the media at large. 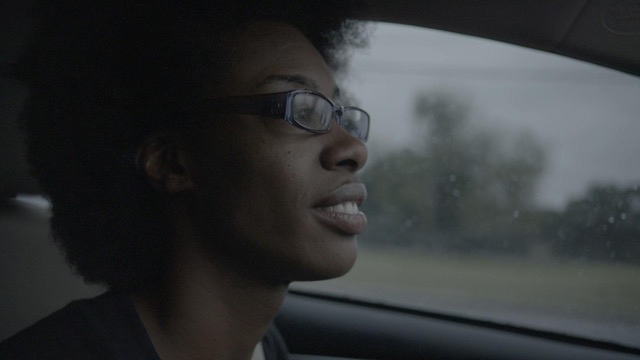 And now with their latest Oscar-nominated short, Traffic Stop, the duo have turned their lens—and once again upended accepted narratives—on the hot topic of police brutality through the story of Breion King, an African-American schoolteacher in Austin, Texas, whose entire life changed after she was stopped for a routine traffic violation by a white officer. What should have been an innocuous local encounter resulted in a hard-to-watch arrest—all painfully captured on police dash cam and subsequently broadcast to the wider world. Documentary reached out to director Davis to discuss a broad range of subjects, from accessing police footage, to the dangers of cultural miscommunication, to the dire need to expand our current bad-cops-caught-on-camera conversation. I’m a longtime fan of Southern Comfort, which was truly a deep-dive character study. While that film dealt with transgender issues well before the topic became trendy, Traffic Stop seems to me much more focused on its of-the-moment subject matter than on its main character. I didn't get to know Breaion as well as the couple at the heart of Southern Comfort. Perhaps that had to do with the running time, though. Did you ever consider making this a feature-length film, or was Traffic Stop always going to be a short? Kate Davis: Traffic Stop was always intended as a short, in part because it really is about one afternoon in Breaion's life—a single, unexpected, dramatic run-in with the police. I approached the film more as a distillation of that event, in jarring juxtaposition with her everyday life, which I felt could be suggested through a few scenes—of Breaion dancing, teaching her second-graders, going to church. A few lines from her illuminate how race played a role in her life since childhood, and how being violently treated by the police has left her changed. Basically to me, a short is another genre that presents a story in a different, more poetic way. Southern Comfort involves a longer, more complex weave of characters and plot. I hope that with the short form I can bring the heart of a person's drama to light in essentially a few lines, rather than a novel. Overly aggressive cops caught on dash cams seem to be almost a regular occurrence these days—just another unfortunate part of our media landscape. So what was it about Breaion's story specifically that made you want to make a movie? I was struck by Breaion's courage, both in her physical resilience to her arresting officer's brutality, but also in her questioning the police directly and openly shortly after her takedown. I think she can be a role model for people—as a minority woman who stands up to power and stands for truth. Did you try to contact the arresting officer, or was this always going to be Breaion's story? Well, in the film we actually hear the officer's story, in his recounting the events to another officer, all caught on dash cam. Other than that, I think that it was more compelling and grounding to see the world through Breaion's eyes, and place the viewer in her shoes. If the film integrated more interviews with the cops, I think it would dilute the power of Breaion's life story. For me, the film was revelatory in many ways—first and foremost in addressing the double-edged-sword nature of technology. While police cams may provide transparency (or not), those images captured can also distill an individual into the worst day of their life—dehumanizing both the perpetrator and the victim. Breaion notes that before her horrific encounter went viral, a Google search of her name might turn up pictures from her modeling days—and now mug shots are at the top. As a filmmaker how do you balance your desire to create an "honest" portrayal with the potential real-life consequences for your characters? I think Breaion is being honest throughout, and the real-life consequences she speaks about with raw candor. As filmmakers, we always select what we edit into the film, so in the end I have to trust myself that I'm being true to what I feel the subject is experiencing. There is no science to this. Another big revelatory moment occurs not during the actual violent incident caught on camera, but in the video from inside the police cruiser in which Breaion finds herself transported by a different white officer. They have a surprisingly candid conversation about racism, which upends many preconceived notions we might have had. Breaion mentions that she doesn't hate the police—she even has a sister who is a police officer. The otherwise polite officer matter-of-factly points out that African-Americans have a problem with "violent tendencies." What's shocking is that these officers may actually be completely blind to their own racism—which is as chilling as the overt racism of Charlottesville. How did you go about uncovering such remarkable footage? We were able to get many angles from different police cars through Breaion's lawyer. This indeed is a startlingly honest conversation, which reveals how deeply institutionalized racism is in law enforcement. Again, it amazes me that Breaion was able to be curious and to listen so intently just after being essentially beaten up and cuffed in the back seat of the cop car. The editing itself is also a slow reveal. We don’t know about Breaion's background when we're first introduced to her, the way she overcame a difficult childhood through her almost zealous pursuit of education. Instead, we merely get glimpses along the way. How did you decide how much to reveal and when in the film? I went with my gut in editing this, slipping small amounts of biography in so that the images of Breiaon's life were dominant, and the few bits of info would suggest a lot about her character. If the film were loaded with information, I think it would take away from the beauty and physicality of her life as a teacher and dancer. So the facts of her background are few, but each one all the more important. The film is also a study in miscommunication. The officer and Breaion are living in completely different realities—which results in a dangerous collision when those two realities meet. When the cop is shown on camera explaining what happened, one could arguably say he’s telling the truth from his viewpoint. Yet also that he is responsible for escalating rather than deescalating a conflict (and thus should not be trusted with a gun!) It reminded me of the subjectivity, and perhaps even "unimportance" in everyday life, of what we call "truth." Which made me wonder how you as a nonfiction filmmaker grapple with this longstanding documentary "ideal." I did think that there was an almost "inevitable collision" between Breaion and the arresting officer—that two worldviews would have to collide at the moment he approached her with his own triggers, and she dealt with him with her own feelings. I hope the film is a conversation starter about how each "side" can learn from the other. Though it is incumbent upon the police, who are in power, to check their own biases more carefully, and realize that their triggers can quickly lead to the tragic breakdown of another's spirit—or worse, the loss of life. Traffic Stop will screen at IDA's DocuDay on March 3 at 3:30 p.m. at the Writers Guild Theater in Beverly Hills. The film also premieres on HBO on February 19.